Wireless router can be protected using WPA (Wi-Fi Protected Access) or WEP (Wired Equivalent Privacy) keys. Your Wireless network will be detected on all wi-fi devices but only devices that enter correct WEP or WPA keys can actually connect to the network to use internet. If you happen to forget WEP / WPA of your router, following is easy procedure to recover it. 1. Connect router & computer at your place with Ethernet cable. 2. After physical connection, open web browser (either of Internet Explorer, Firefox, Chrome or so on). 4. You will get prompt to enter username & password to access router settings. If no username, password was setup during first time installation, then username admin and password password should work fine. Alternatively, you can check router manual for possible login details or try to recall login details entered during first time setup. 5. In the router settings, goto Wireless tab option. Look for WPA or WEP key listing. 6. Note down the key. Close the browser window and disconnect the cable. Now to connect to wirless network, double click detected network. 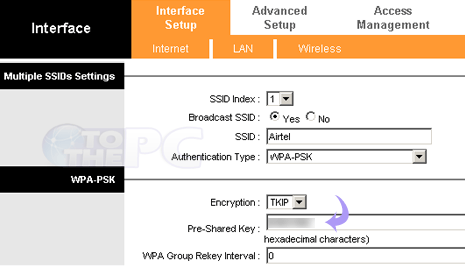 Then type WEP / WPA key in the pop-up window, entering correct key will establish wireless connection.